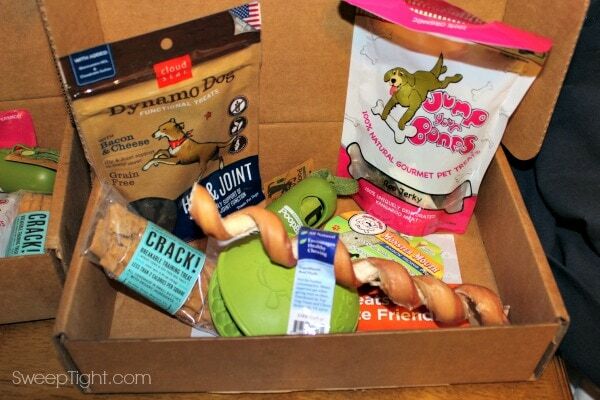 I was sent boxes from Happy Dog Box for review. All opinions are my own. As you probably know by now, we love to spoil our pets. 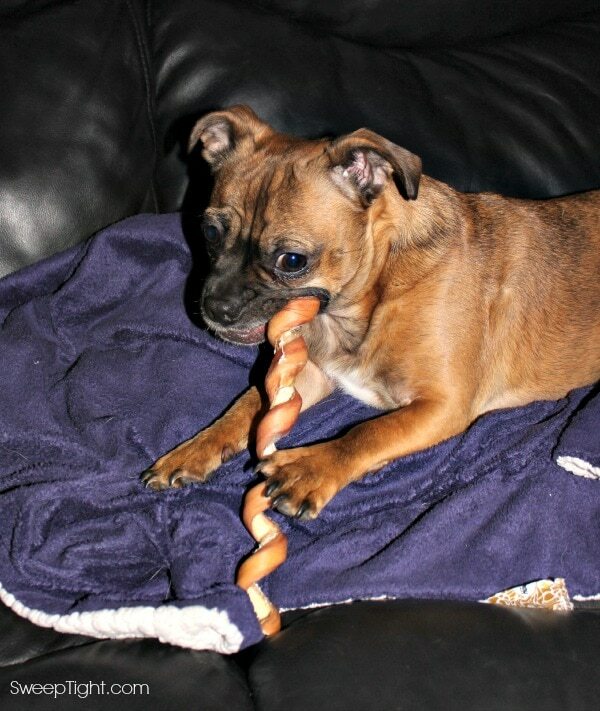 We enjoy giving them new toys and dog treats frequently. Happy Dog Box is an easy way to do that on a regular basis. We received a Happy Dog Box for each dog – one medium and one large. 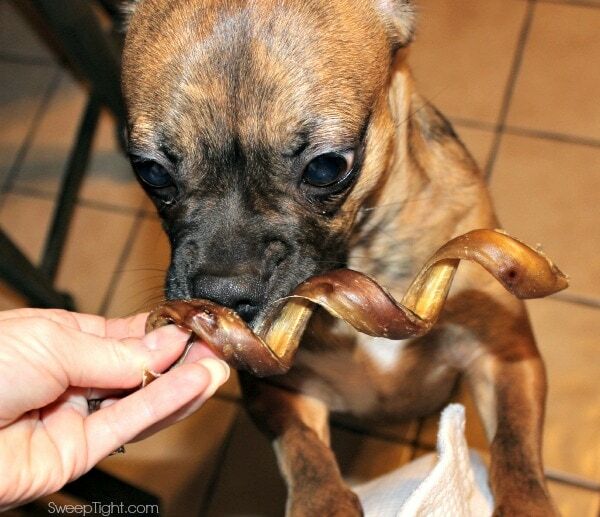 The only real difference was the size of the Barkworthies all-natural dog chew treat. I am sure it depends on which products are in the box each month. As usual, the dogs seemed to know that the boxes were for them. They immediately got excited before I even opened the boxes. I am sure they could sniff out the goodies from a mile away. Each box contained one of each of the following: Premium chew from Barkworthies.com, PoopBags from EarthRated.com, Jump Your Bones nutritious treats from JYBPetTreats.com, Woofables handmade biscuits from WoofablesBakery.com, Dynamo Dog Functional treats Hip & Joint formula from CloudStar.com, and a Monster Mouth treat dispenser from JollyPets.com. The Grump is all about chewy treats and this one was extremely appealing to him. Of course, he definitely noticed that Hilo got a larger one. Keep your pets occupied for a long time when you place their treats into the Monster Mouth. This provides quite the challenge for them to work to get the treats out. Hilo is way less food-obsessed than the Grump. He didn’t really care to do too much work to get the treats from the Monster Mouth, but thoroughly enjoyed the chew stick. The Grump is more than willing to put the time in to get the treats out! This can keep him busy for an hour or more. Look who pulled a switch-a-roo and got himself the bigger treat. He seriously waited until Hilo wasn’t looking, dropped off his smaller one and grabbed Hilo’s bigger one. Such a sneaky little genius. 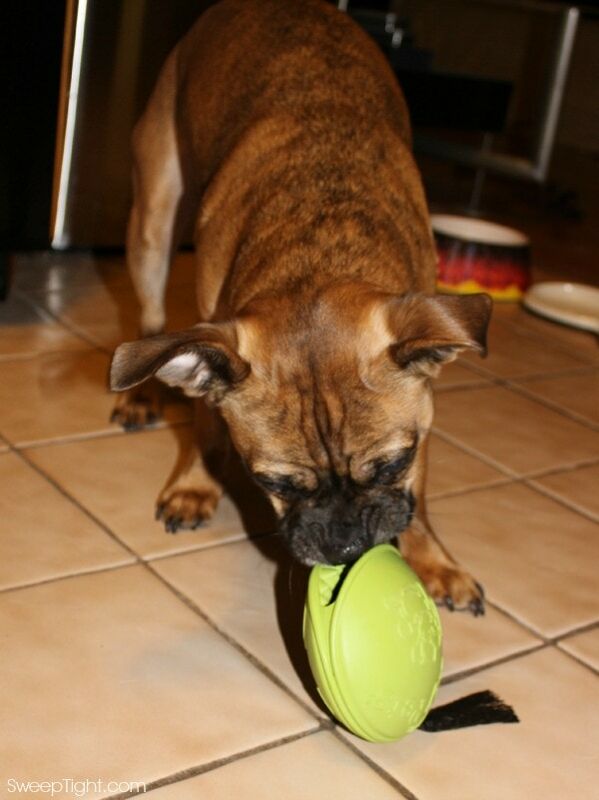 If you are looking for a fun way to discover new pet goodies, definitely check out Happy Dog Box. You can choose which box is best for your pet and receive premium products from high-end brands each month. Happy Dog Box subscriptions start as low as $21 per month. A portion of the proceeds goes toward rescue groups, too. Love a company that gives back! 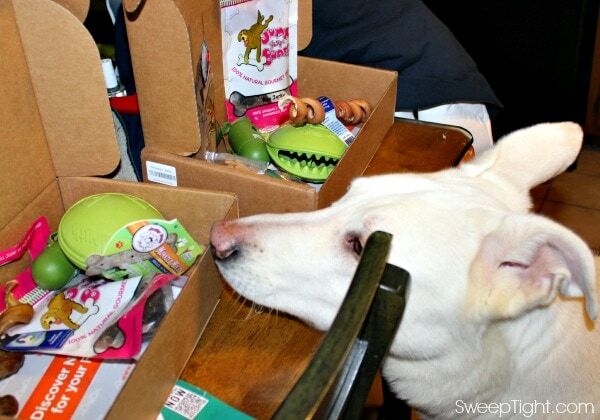 Do you have a furry friend who would love a Happy Dog Box? I can tell that your dogs really liked the treats from Happy Dog. The Monster Mouth makes me smile. My dogs would love getting a monthly treat box. We have a big dog and little dog too and ours do the same sneaky little tricks to get each other’s toys. I’m glad the Grump got a chance with the big toy. What a great idea! Sending this link to my friend with an adorable fur baby, she’d love this!! How cute! I love the idea of hiding the treats and making him work for them. I am going to have to check out the Happy Dog Box! I have three dogs and I am always looking for new stuff for them! Your dogs are the CUTEST!!! These have a lot of great items in them! I love the idea if giving these to a dog for a birthday or Holiday and having it come all year. I really like that whole Monster Mouth idea. What a great way to keep them interested in something for a while. Seriously he’s been at it for most of the day. LOL I almost feel bad because the treats might be a little too big!! Oh my…My dog would love this!! New goodies every month! Love it! My dog would absolutely love this. He loves getting new treats and toys. you puppies are so cute!!! What a fun box for them. My two pups would be so happy to get those treats! 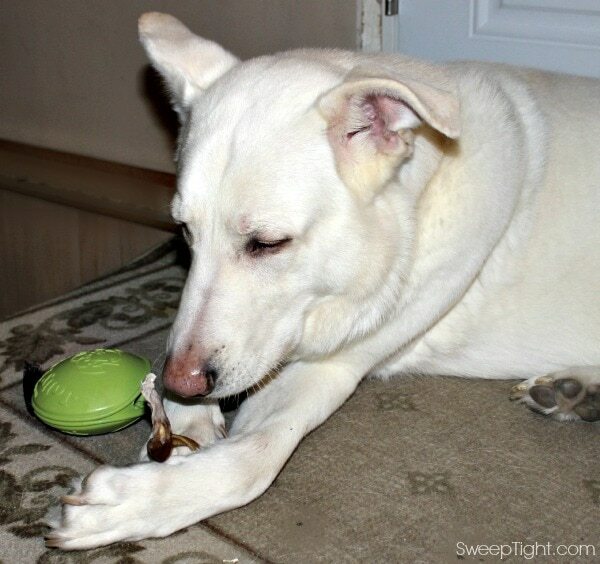 so cute, your sweet doggies seem to really like their goodies! I haven’t heard of the Happy Dog Box. I have two dogs, so i’ll have to check it out! Oh my gosh! Your doggies are so adorable! I know my dog would love this too! I ordered a month of this and loved it.. too bad its not in the budget every month!